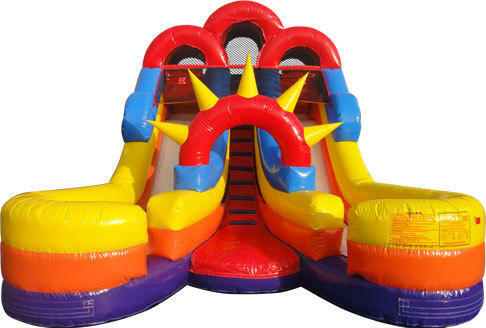 The Double Splash Jr. Slide is a dual wet or dry slide guaranteed to add tons of excitement and acceleration to any event. Great for promoting friendly competition or group challenges, kids can climb together up the center climb, and then choose a left- or right-sided slick slide, for a fast-track ride to the splashing slide . Hooded safety on top makes sure riders slide down properly. The bright and colorful theme fits into any décor. Customers must supply a working hose that will reach inflatables. **Adult Supervison is ALWAYS recomended on any of the games and inflatables that we offer.